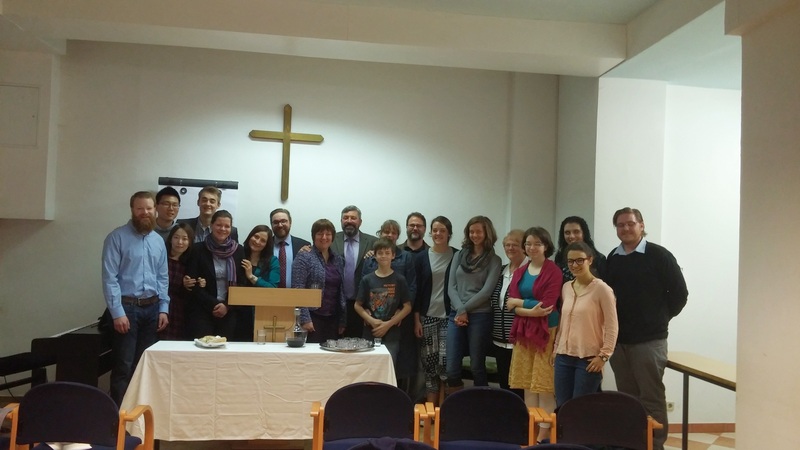 In September 2012, the Evangelical Presbyterian Church in England and Wales (EPCEW) began a monthly church planting Bible study in South-west Berlin. However, like any work of church planting it rarely begins without preparatory work before-hand. In the providence God, our family served on the mission ship for two years, the MV Doulos. During this time, I held a voluntary Bible study on the Book of Romans in our cabin and many young people came to a reformed understanding of Scripture. Some of the most enthusiastic people were Germans, especially two young men called Marius Wahrlich and Dominik Frank. When the work of church planting got under way for Sheffield Presbyterian Church (www.sheffieldpres.org.uk), Marius and Dominik would remind me: “Do not forget Germany”. As we are all aware, Western Europe is indeed a mission field in 2014. The church planting committee of EPCEW were in much discussion during late 2011 and into 2012 concerning Germany and subsequent to a number of “on the ground” meetings in Germany, it became clear that a potential church planting nucleus was developing in Berlin. The small group of German believers showed great initiative as they published the Westminster Standards (which had already been translated) for the confessional basis of the church, along with a German hymn book. They established a Presbyterianische Kirche, Berlin website (www.epkd.de) and a Facebook page. After several years of having EPCEW ministers fly over to Berlin to lead studies, and strengthen the core group of believers, a young German minister named Johannes Müller was called last year to formally plant a German-speaking church in Berlin. The church was officially made a mission church of the EPCEW on May 17th, 2015 and Johannes hopes to complete his ordination exams later in the summer after which he will be installed as the minister. This fledgling work would value your prayers for stability, for spiritual and numerical growth, and for wisdom and discernment for the leadership of the work. If you (or someone you know) is living in, or visiting, Berlin be sure to visit (you can find the details on the website or contact the leadership). May this church simply be one of many that will be planted in Germany in the years to come! For more information concerning this work in Berlin or church planting possibilities in England and Wales, then please email Kevin Bidwell, the minister of Sheffield Presbyterian Church at: kevinjbidwell@me.com.